Carl G. Washburne Memorial State Park encompasses both sides of Highway 101 along a relatively flat stretch of pristine coastal forest that runs down to a seemingly endless beach. Hiking trails lead south through the park to the nearby Hobbit Trail and to Heceta Head Lighthouse and Devil’s Elbow. The park is named after Eugene businessman Carl G. Washburne, who was the Oregon Highway Commissioner from 1932 to 1935. It was Narcissa Washburne, Carl’s wife, who gifted the land to the state in her estate in 1962. The campsites in this stunning campgound are nestled in lush coastal forest a half mile from the beach. Most of the sites are for RVs and offer more privacy and natural beauty than most average RV sites. 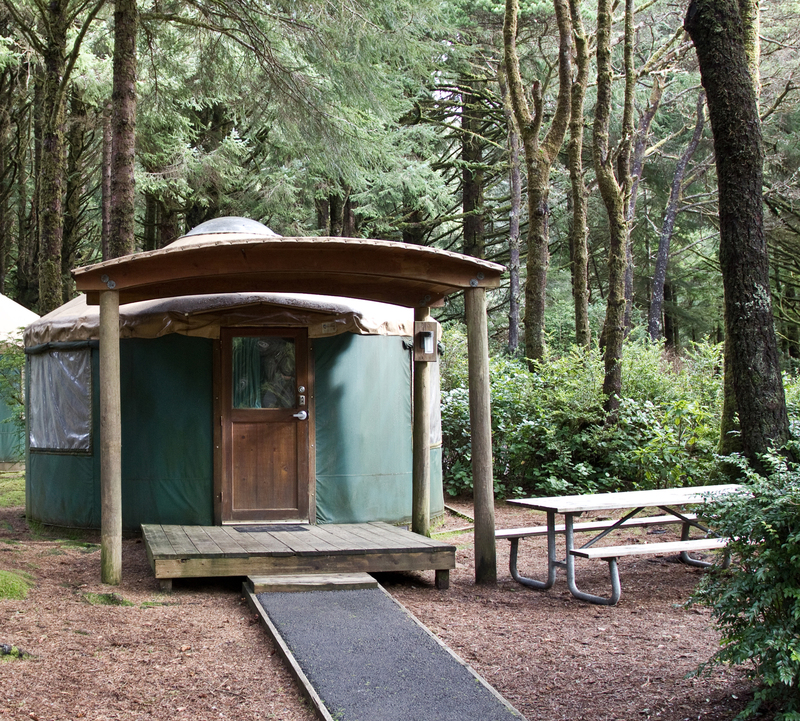 There are also two yurts, a hiker and biker camping area, and seven gorgeous walk-in tent sites. The walk-in sites are located at some distance from the rest of the campground and are in a slightly more open part of the forest. A few of these sites are literally carpeted with thick moss, providing an otherworldly backdrop to your stay. Don’t let the short, level walk from the parking area deter you from giving one of these beautiful sites a try.